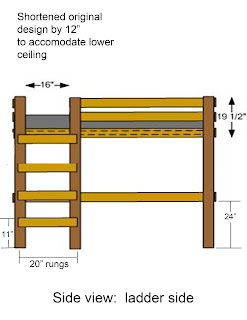 The following is a new version of the loft bed plans I originally posted here. The instructions have been updated and reformatted by Ricky (AKA "homesickpolarbear"). I welcome any other suggestions, additions or changes that help make these more useful. Please send me your comments, pictures or plan updates and I will fit them in here somewhere. I hope you find these plans helpful. Note: This version of the plans are 12" shorter than original. All 1x’s are in original widths, you will not have to rip any pieces down, just cut to length. 3/4" x 41" x 75"
2 Clamps – Opens bigger than 4 ½”. Quick clamps seem to work better. Lay all 5 of the 4x4’s side by side and make sure they are lined up. Measure up 24” and draw a line across only 4 of them. Measure up 44 ½”, 53 ½” and 62 ½” and draw a line across all 5 4x4’s. On all 5 4x4’s, draw this same line on all sides, this will come in handy during construction. I found it easier to put the end pieces together first, but only the bottom support rail. Make sure you put the end pieces on the outside of the 4x4’s. Line up the bottom of the 1x6x48 3/4 at the mark you made at 24” on the 4x4 and clamp it there. Line up the bottom of that same 1x6 to the 24” mark on your next 4x4 and clamp it there. At each end of support rail, measure down 1¼” and in ¾” and make a mark. Also measure down 3¼” and in 2¼” and make a mark. If your clamp is in the way, just start with the top marks. Drill a 9/32” hole at each of the marks. With your ¾” spade bit, countersink 3/8” on the 1x6 and 4x4. Put a washer on your bolt before you put it through the hole. Put another washer on the end of the bolt and then put your nut on. Tighten bolt with drill and flat head bit and socket on the nut. 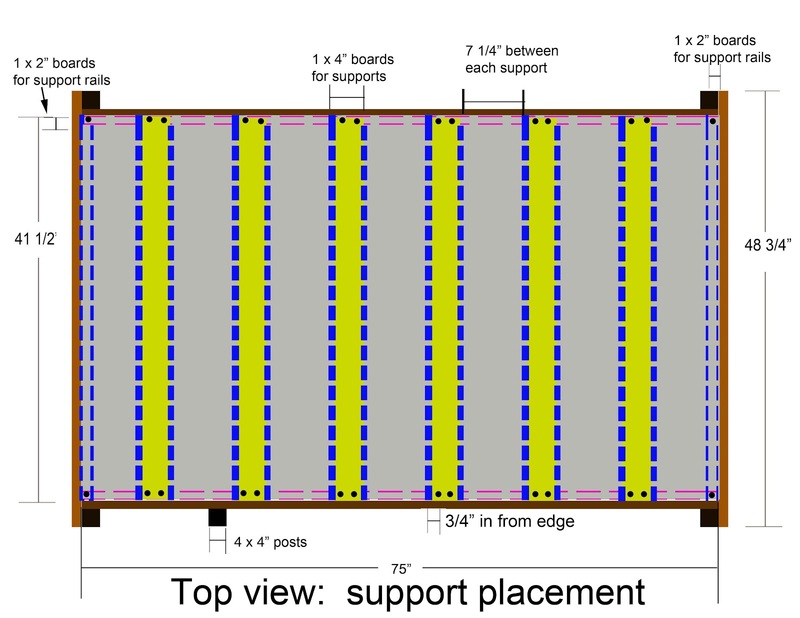 Put the 1x6 on the inside of the 2x4’s and line up with bottom supports of end rails. Measure down 4¼” down and in 2½” and make a mark. Follow above steps to drill, countersink and attach board. NOTE: Before you put up the rest of the side rails, make sure you figure out where to put the ladder. The ladder should be at the foot of the bed, this will prevent your child from possibly falling out of bed. Attach your 3 side rails on the OPPOSITE side of the ladder side. Follow steps 2 and 3 until you have all end and side rails attached. MAKE SURE END RAILS ARE ON OUTSIDE OF 4X4 AND SIDE RAILS ARE ON THE INSIDE OF THE 4X4’S. 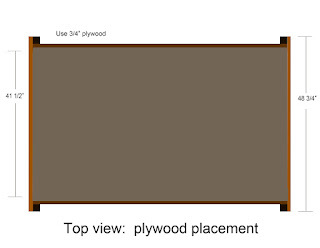 Place 1 1x2x75” on the inside of the bed rail at the bottom, make sure it is flat and not standing up. Once this piece is straight across the bottom of the 1x6, clamp it into place. Towards the bottom part of the 1x6, on the outside, measure 1” out from the 4x4 and mark that line. Also, make marks at 1”, 7”, 13”, 19”, 25”, 31”, 37”, 43”, 49”, 55”, 61” and 67”. With your speed square, measure up 3/8”, at every 6” mark, and make a mark there as well. 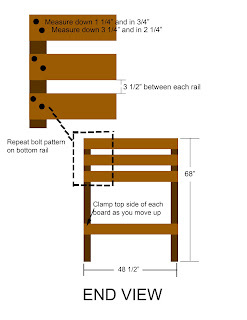 Get your 1x2x41½ and place it on either the very right, or left, side of the mattress rail against the end rail. Since gravity is on your side, you will not have to clamp these. 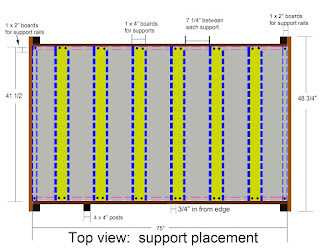 Place the other 1x2x41½” 1x2 at the other end as well. Pre drill a 3/32” hole at the end of each rail, where it overlaps the mattress support. Screw in one 1¼” Torx screw in the end of each rail. Measure out 7¼” from each side of the first rail and draw a line, this is where the full size supports come in. 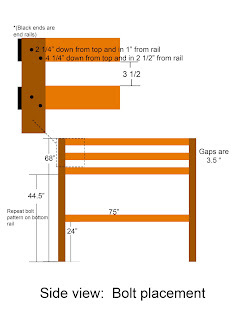 Place your first 1x4x41½” at that mark, making sure there is a 7¼” gap between the rails. On the 1x4, measure 1” from the end and draw a line across the board. Measure in 1” from each side and mark that spot, this will be the screw placement for the rails, make sure you do this at both ends. 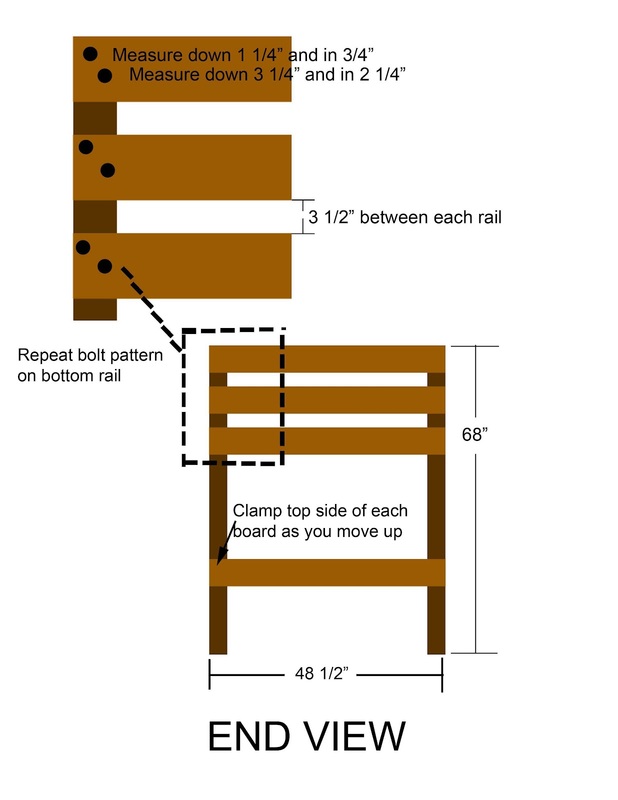 You can mark this for all remaining rails, to make it easier to measure, before you put them on the mattress supports. Put a 1¼” Torx screw in each pre drilled hole. Making sure you space another 7¼” inches, pre drill a hole at each mark you just made and screw it into place. Continue this until all your rails are screwed down. Step 7: Attach last 4x4 for ladder. A. Measure 16” from the inside of the corner of your 4x4 and mark that measurement with your speed square. Now you will need your last 4x4 for your ladder. Line up the edge of your last 4x4 on the line you just made, make sure the inside of the 4x4’s are 16” apart. Lift up your bed support rail, just a little bit, and clamp the 4x4 to the bed rail. 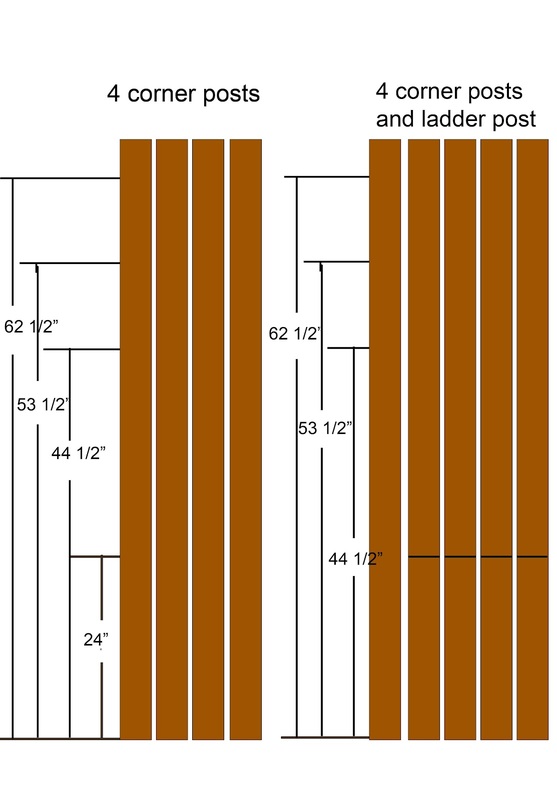 This will help your ladder to say where it is supposed to stay during settling. 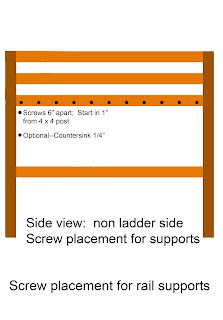 Use instructions above to bolt ladder 4x4 support to bed support. 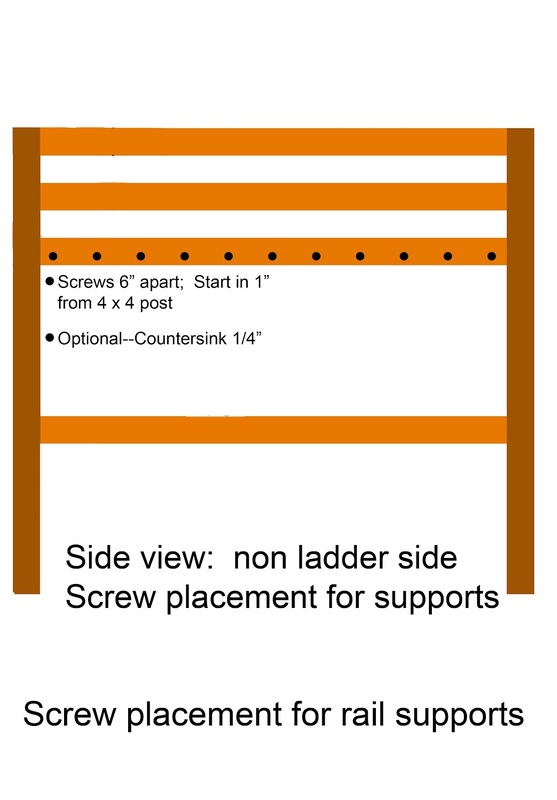 Attach the last two remaining rails, 1x6x55½”, to the inside of the 4x4 corner post and ladder post. On ladder 4x4, measure up 11” from the floor and make a line with your speed square, also make the same mark on the other ladder support / corner post. Mark measurements at 22”, 33” and 44”. 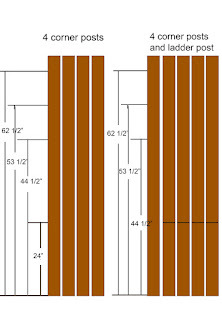 Draw a line across each post with your speed square. From the top of the board, measure 1” down and from the bottom, of the board, measure 1” up and put marks where the screws are going to go. Line the top of your 1x6x20” at the first line you drew and clamp it there. Repeat this process until all of your rungs are up. 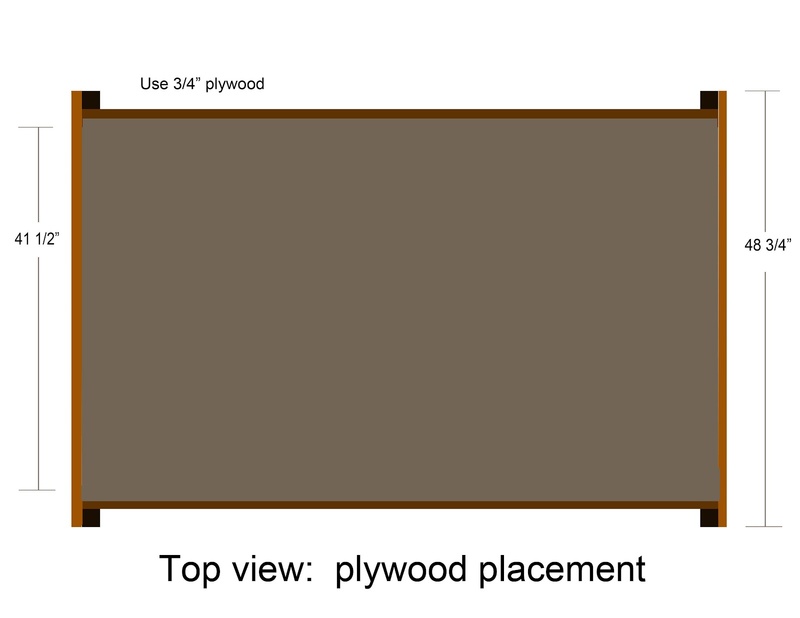 With a friend’s help, put the piece of plywood on top of the of the 4x4 posts, to help you balance it, and place it into the middle of your frame. This should be some what of a tight fit. You do not have to screw it down as you will find out it will not go anywhere. Now you will need your plugs. Brush a small amount of glue around the part of the plug that will go into the hole, and also brush a little bit of glue in the hole that the plug will be going into. Continue this until all holes are filled. Once you are at this point, you are practically done. You have the option of either painting or staining your new loft bed, or save it for another small project that you can involve your child in, they would, more than likely, LOVE to help put the finishing touches on their bed. Congratulations, you have just made your child one sturdy loft bed! If you have any questions or comments, please feel free comment below or you can email the creator of this new version of the plans at homesickpolarbear@gmail.com and we will get back to you as soon as possible. If you've found these plans useful please link to them and spread them around. I have to show this plan to my husband. 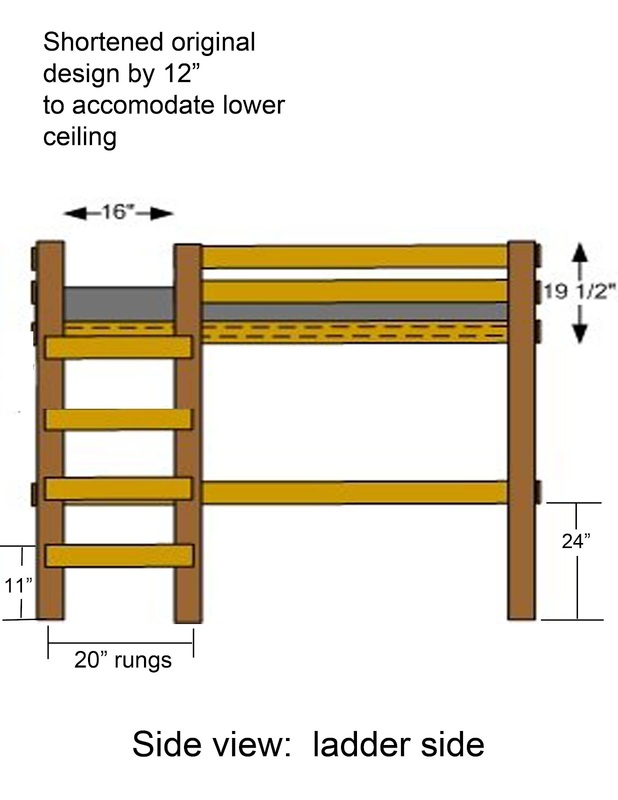 Thanks so much for this loft bed plan. He'll do the bed, I'll look for the perfect mattresses. Good luck with the build Florence. Let me know if you have any questions along the way.